Changes to the 2007 Constitution, in relation to election eligibility of persons in the British Virgin Islands (BVI), must be discussed with the people of the territory before any efforts are made to have amendments to the Constitution. This is the position of Hon. Ronnie Skelton—who will be seeking to lead the territory in the next election. According to the 2007 Constitution, a person seeking election into the House of Assembly (HoA) must be a Virgin Islander of the age of twenty-one years or above. To qualify as a ‘Virgin Islander’ in this case, a person must belong to the Virgin Islands by birth of a father or mother, who at the time of the birth belonged to the Virgin Islands by birth or descent; or born outside the Virgin Islands of a father or mother who at the time of the birth belonged to the Virgin Islands by birth or descent. According to Hon. Skelton—who was a member of the Constitutional Review Committee, this issue is a complicated one that would require public consultations before any changes are considered. “The issue of who is eligible to run for political office in any country is governed by the Constitution,” he reminded. He went on to say that there are over 110 different nationalities living in the BVI. These requirements, he stated, were birthed out of a need by the people for the elected representatives to be familiar with the culture and history of the territory. Hon. Skelton also reminded that a Constitutional Review is overdue since the ten-year deadline was up in 2017, but this was delayed by Hurricanes Irma and Maria. It should be noted that the 2007 Constitution also withholds belonger status from children born in the BVI to expat parents. As a result, there is a category of stateless individuals who have to reside in the territory for 18 years before seeking to regularize themselves. 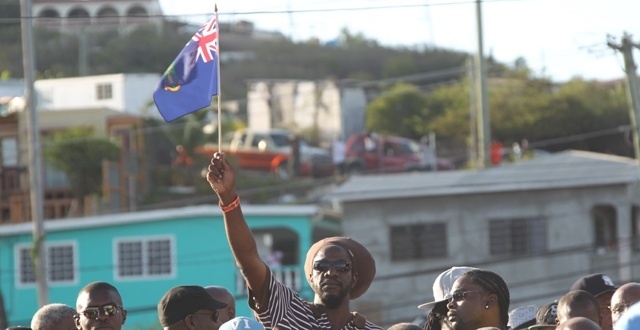 In the territory, many adult expats, who form the majority of the BVI’s workforce, also have no voting rights and access to land because they don’t have belonger status. There have been questions over Chairman of the National Democratic Party (NDP), Hon. Myron Walwyn’s eligibility to run for office because he was born to immigrant parents. There were even plans by some to challenge his eligibility in court, despite the fact that he was born and raised in the territory, and later regularized. Hon. Walwyn had even recently admitted that he faces discrimination within his party as a result of this issue. Back in 2017, the government—which Skelton was part of at the time—had announced it will be reviewing its policies on residency and belongership in the first quarter of 2018. This has not yet been done. This commitment was made after government took note of deficiencies in policies related to residency and belongership. Back in 2016, a United Nations Children's Fund (UNICEF) report alleged that the BVI’s laws are set up in a way to abuse and exclude expatriates and their children. We MUST keep the Virgin Islands history and culture!!! We can not let others dictate our Country! Just like in the US, where Trump is trying to keep it from being overtaken by others, We MUST do the same. If not, we will be like St. Thomas, or Jamaica, or any other island. We are too small to allow outside interest to vote and we lose our land and heritage. What would H.L. Stoutt do? What would Theodolph Faulkner do? Virgin Islands for Virgin Islanders!!!! PLEASE for the sake our children, grandchildren, great-grandchildren! What will we leave them??? Funny, I recall stories of the same VIP administration under HL Stoutt selling out the land to foreigners. Look at who own our outer islands. It is not locals. Yes TRUMP is trying make American great again but his party members did not desert him no matter how deranged he seem to be by others. so yes WE can certainly take a page out of his playbook. So who allowed us to lose our CULTURE. As I see it, it was the Cultural Minister who gave us a national song and a national dress to call our own. Come on man. Give Jack his jacket and stop this nonsense. Thank God we have more intelligent people living in our society who can see and think for themselves. Only the foolish will buy into this so called "Keep our Culture Alive" farce. So where you going with this again Mr. Skelton. That dog has been beaten to death. It was already established that an amendment was made to include those persons who were already in the Government. (ie Walwyn, Archie, Mark). When you done, you and your newly formed party want to accuse others of being devisive? No one is denying you of your right to represent the people of the VI, but please understand that we have become a melting pot society and need someone who is for ALL not some, who call the VIRGIN ISLANDS home. They too want to see the best for our HOME, otherwise they would have left. I am married to someone whose parents were not borned here (need I add like some in your own party) and it hurts me to see how we so irresponsibly cause a divide. I beg you fix this thing or you will all pay at the polls. The talk, if you are listening to the PEOPLE, is that we are tired of this type of politicking. We want to hear your plans for the future. This alone will alienate hundreds of BVIlanders born to immigrant parents, who ironically have the ability to vote. They’re basically saying you could be born here, educated here, Start a business, represent the country abroad... but can run for the highest office in the land. They just handed the opponent the dagger they gon fall on.